I’ll get back to rudders eventually but as I walked the dogs this morning I had the thought that I should have you take a look at this. 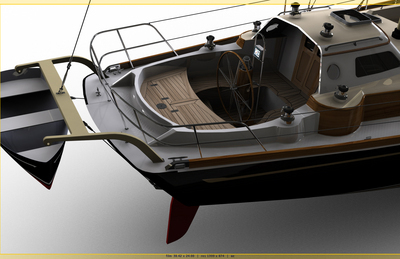 I first met Rick Beddoe (we call him “Sons” on Cruising Anarchy because he uses SONADORA as his handle there) years ago when he asked for drawings for his Baba 30 so he could do some 3D renderings of it. Time past and soon I received some images from Rick. They were awful. The little Baba 30 was turned into what I thought looked like a blow up bathtub toy. But I encouraged him to keep going. Years later Rick showed up on Cruising Anarchy (CA) and joined in the discussion of a hypothetical design we were playing with on the site. Rick volunteered to do some renderings for us. He did and in typical CA fashion the group pounced on him with a lot of candid comments on the quality of his work. It got pretty bad and at one point Rick almost said, “It’s my football and I’m taking it home.” But he didn’t. He stuck around and kept working on his 3d rendering skills. So he passed the initial CA initiation requirements and now the group began working with him with positive and constructive criticism. Quite quickly Rick was turning out amazing renderings. In fact they were so good that I hired him to do some rendering work for projects I had going. Clients love this stuff. For the client or client’s wife who may have problems really reading the 2D drawings I produce Rick’s work produced virtual photos of the finished boat. 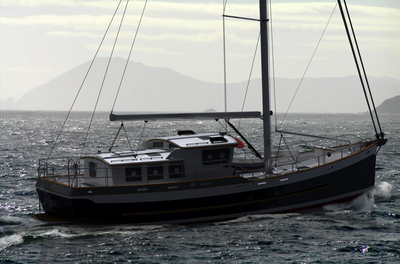 In the case of the 58′ ketch for ND. I was having some trouble with picturing exactly how the aft cockpit area would segue with the area under the overhang of the aft raised house. I’m a good draftsman but I was struggling with this area. I called on Rick with the directive, “Please make this work.” It took a few tries and we went back and forth on the exact way to do it but in the end Rick got it right. Rick has the designer’s eye and that makes our work together much easier. With good old Steve Davis gone to that big design office in the sky I won’t have the luxury of his beautiful 2D renderings anymore. It’s a damn shame. And Rick will tell you that he is no Steve Davis. But Rick’s stuff is 3D and that takes the rendering to a higher level. 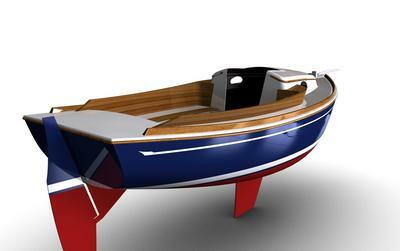 It’s fun to have one of Rick’s renderings with the software to revolve the boat and look at it from any angle. Rick is also the guy who set up this blog for me. “No worries Bob I can set that up for you. Great details. Transfer records to file web hosting service web sites to share with you regarding any individual charge.